Among the many reasons it’s worth it to sort through my old emails, I’ve learned, is the below photo. I won’t disclose the sender’s name, but there’s a reason this post is all the more entertaining. Martha! I kinda met her last week at this book signing my boss dragged us to. We were fourth or so in line, and we're pretty sure she'd been fed and medicated, so she was actually pleasant! Don't get me wrong, we were ripping on her and her followers the whole time and we think she's a psychopath, but at the time, she was gracious. Let me guess, those are the lacquered skulls of the minions who brought her the wrong shade of white napkins. 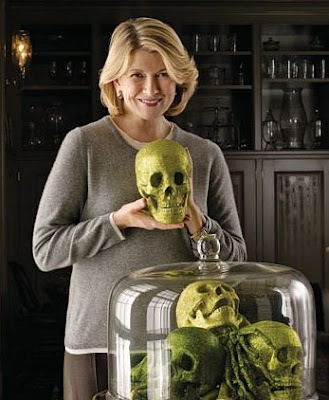 I think "gracious psychopath" is the best description of Martha Stewart by anyone ever.